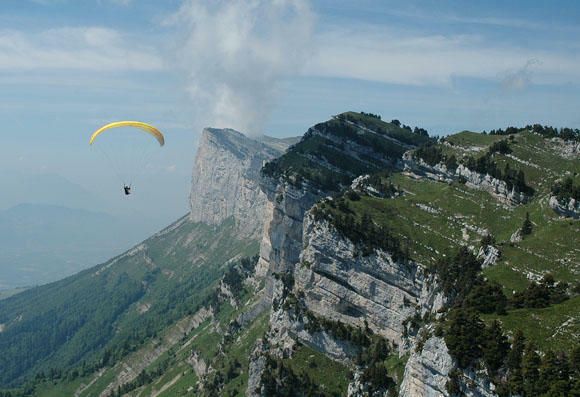 May 1974 : For the first time in the skies over St Hilaire : 3 hang gliders take off from the « Pré qui tue » (« Meadow that kills ») at the foot of the Dent de Crolles ! Daniel Raibon Pernoud, Michel Raibon, Pierre Martin and a few others are instantly won over by this curious new sport. June 1974 : Onemonth later at the FFVL assembly, the Delta Club of St Hilaire is founded. At the stern: Daniel Raibon Pernoud, then President of the Tourist Office of St Hilaire. September 28 and 29, 1974: The Delta Club in collaboration with the Tourist Office of St Hilaire organizes the 1st Coupe Icare: a hang gliding competition including fifty or so participants with a spot landing task as the ultimate challenge ! 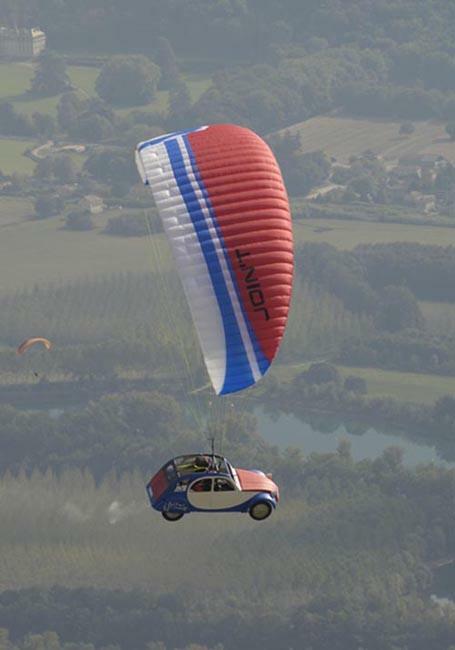 The population of Grenoble witnesses a true show of « men with wings » for the first time, causing a serious traffic paralysis on the highway between Grenoble and Chambéry ! 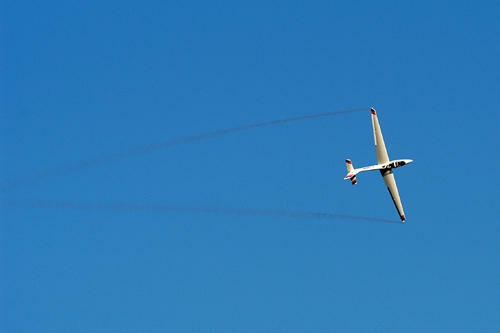 In 1976, the Coupe Icare attracts over 200 competitors; 2 landing targets are needed: a red one for the even-numbered pilots and a yellow one for the odd numbers. From July 29 to August 12, 1979, the 6th Coupe Icare hosts the 2nd World Free Flight Championship... A great moment in the history of free flight St Hilaire ! 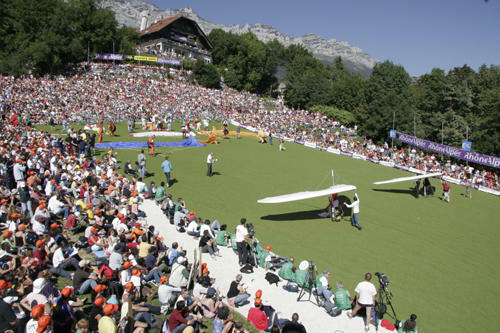 The landing zone covers 5 hectares, where grandstands from Grenoble are set up. After the climax of this World Championship, the following years (80 to 83) are very tough, particularly since long distance tasks are far less interesting for competition spectators. 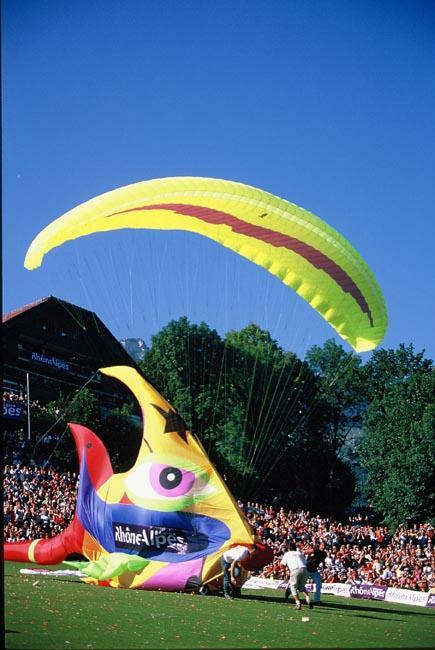 In the early 80s and up to the arrival of paragliding in 1986, the event evolves into something more friendly and festive. 10 films in category Super 8, plus 14 films in category 16 and 35 mm. The first festival jury is presided by Pierre-François Degeorges (France), commentator of the well-known TV programme: « Les Carnets de l'Aventure » and long-time, loyal friend of St Hilaire who never misses a single edition of the Festival until his death in 2003. Other jury members: Bettina Gray (USA), Peter Janssen (RDF), Yves Ballu (France) and Jacques Dubourg (France). 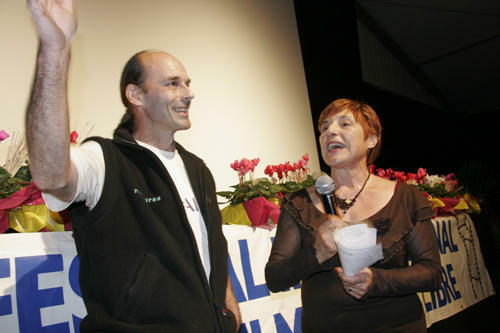 British filmmaker Léo Dickinson takes the Grand Prize of the Festival in all categories with « Sailing above the Alps ». German Charlie Jost - today President of the German Free Flight Federation, is awarded the Grand Prize for Super 8, with « Vol libre, un rêve devient réalité » ("Free Flight, a Dream becomes Reality"), also, Americans Norman Smith and Scott Randon win the Public's Choice Prize with « Double High ». In 1984, the secondhand market is inaugurated and the first professional stands find their niches in the surrounding fields. Costumed flights increase in number: an astronaut, a gorilla, a flower pot, .... What next ? « Vertiges », by Georges Morel, takes the Public's Choice Prize at the Film Festival. 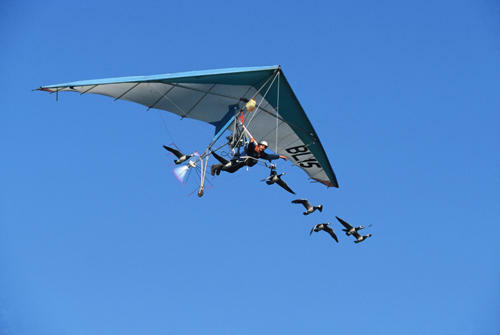 1985-1986 is marked by the arrival of paragliding. 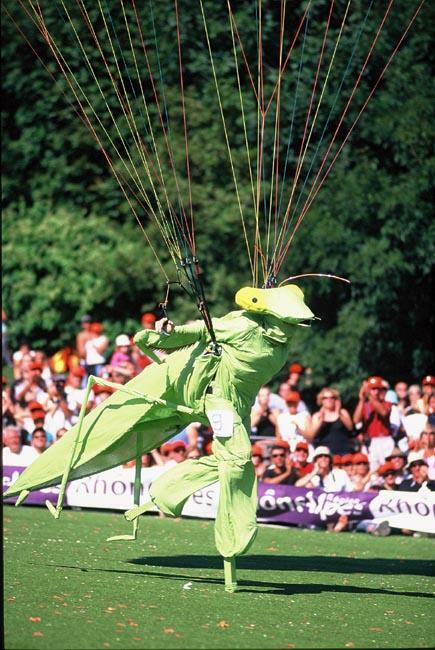 In 1985, Daniel Raibon Pernoud learns to fly at Mieussy and brings back a film: « Entre ciel et herbe » by Isabelle Colbrant, the first film on paragliding to enter the International Free Flight Film Festival. The following year, he coaxes a dozen locals from St Hilaire to sign up for paragliding training at Mieussy. 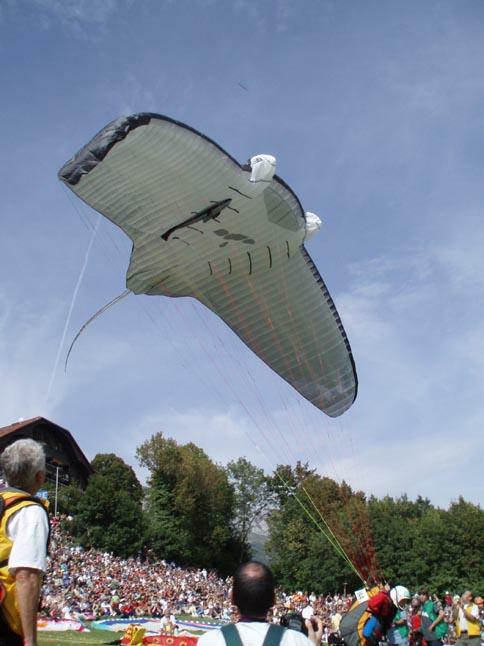 On return, the group of amateurs takes up their chain saws, carves out the launch still used today, and organizes the first paragliding competition in June 1986, after which they offer to host the 1st French Paragliding Championships in St Hilaire. In 1987, the 14th Coupe Icare welcomes as guest of honour: Australian Peter LLOYD, President of the F.A.I. (Fédération Aéronautique Internationale). At the Film Festival, « Supermax » by Philippe Bernard wins both the Grand and Public’s Choice Prizes. 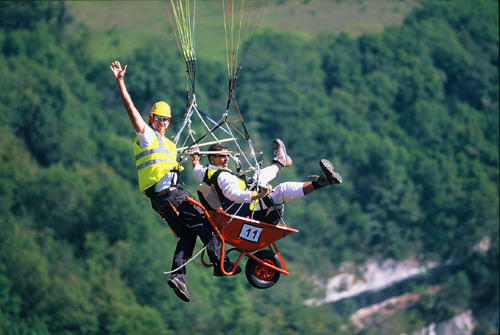 This same year in July, St Hilaire indeed hosts the 1st French Paragliding Championships, and in June the 1st Icare Challenge : a caving, climbing and paragliding triathlon which is repeated in 1988. 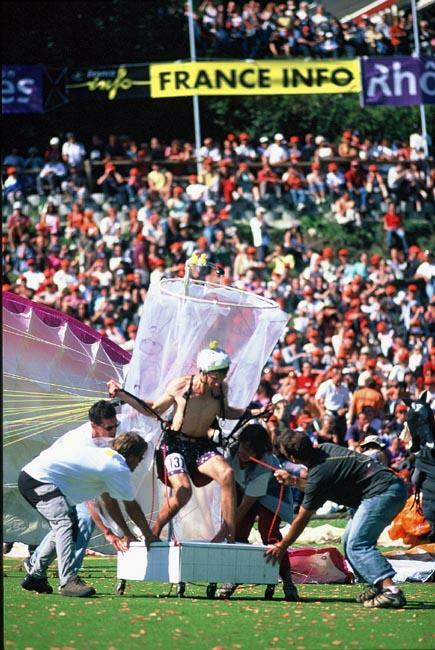 In 88, coinciding with the Film Festival, the first International Festival of Publicity Films using the themes of air and flight is launched.This same year, the 1st European Paragliding Championships are held concurrently from July 16 to 19. 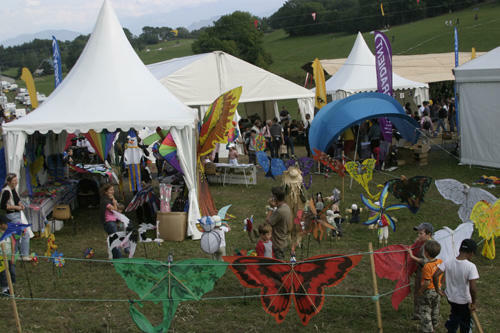 In 1989, considering the growing success of the event, the Icare Festival Organisation (IFO) is founded and based at the Tourist Office of St Hilaire du Touvet. This year, « Emei Shan -Vol de Chine » by Bruno Cusa wins the Grand Prize of the Film Festival and « Super Max II », takes the Public’s Choice Prize. During the 90s, the Coupe Icare slowly but surely shapes its overall format as we know it today. Thereafter, up to the year 2000, all Festival projections are held under the marquee before being moved to a smaller tent adjoining the Air Sports Expo, to allow for non-stop film projections every day. - Air Sports Expo: In the early 90s, the second hand market created in 84 by a group of pilots, turns into a trade fair for new and used machines and equipment; and this turns into the Icare Expo which carries on today. In 92, the first list of stands includes 25 manufacturers and distributors. The first giant tent is set up in 1994 for a total of 80 stands. In 96 the entire expo area is covered. Second hand material organizers structure paragliding equipment indoors and hang gliding outdoors. - Masquerade Contest: from 1987 on prizes are awarded for the best costumes. This contest gives the Coupe Icare its crazy, colourful reputation (to say the least)… For sure one encounters some pretty strange birds over the skies of St Hilaire : from witches to frogmen, cartoon characters, aviation heroes, a catamaran, a locomotive, a crane taking off on stilts, the 3 little pigs, a Chinese pushcart, a cowboy on his horse, a yellow submarine, Christ on a cross, a postman on his bicycle, etc …. - Aerial demos : they begin in the early ‘90s with the IBIS Show, then work into loopings performed by Swiss pilot Olivier Valiton, and an Ailes de K aerial ballet, to spice up the spectacle, …. 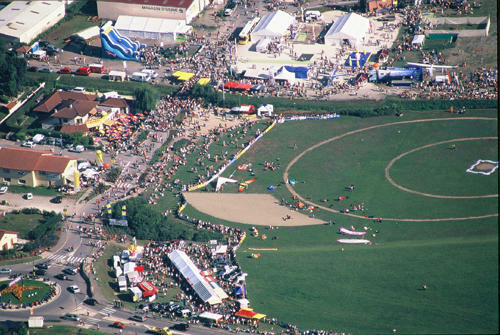 Later, other disciplines add their own demos: sail plane, parachute, paramotor, kite and other aircraft...- Workshops for children are added in 9, and turn into a whole area for kids in 2000. - Musical and visual entertainment, plus street shows grow and change over the years, so there is never a dull moment in the Coupe Icare programme. - In 1993, the Coupe Icare celebrates its 20th anniversary: a whole week of festivities, a Festival of Festivals, the first gathering of rigid wings, organized animation in Lumbin…. 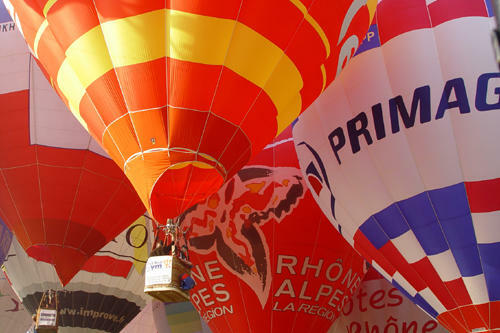 - At the end of the 90s, the Coupe Icare joins up with the Rhône Alpes Region; a privileged partnership that boosts recognition and media coverage for the event. 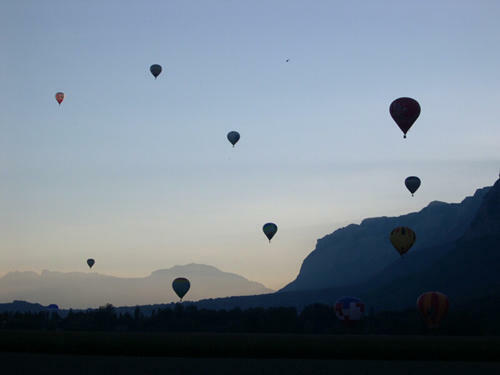 - Between 1991 - 1998, St Hilaire du Touvet also hosts the Free Flight Medical Congress every Fall. La Coupe Icare is getting on - that is approaching the ripe age of 30 ! Music plays a big part in theCoupe Icare ... It starts with the Rock'en Vol festival, in 2000 and 2001, under the cafeteria tent. Then, in 2002, comes the Turbulences festival installed on the South launch. A victim of its own success, its last edition is held in 2005. 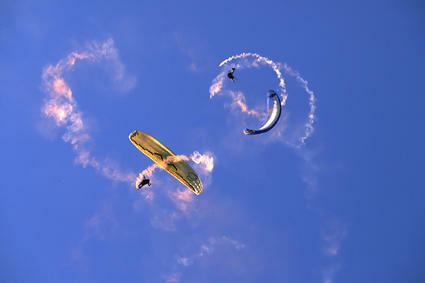 - Heart-stopping demos by some of the world’s top pilots: hang glider and paraglider high voltage aerobatics, speed gliding, wingsuit, sail plane stunts, Air Force stunt squadron, ….. In 2005, for the first time, the Coupe Icare mourns a fatal accident. 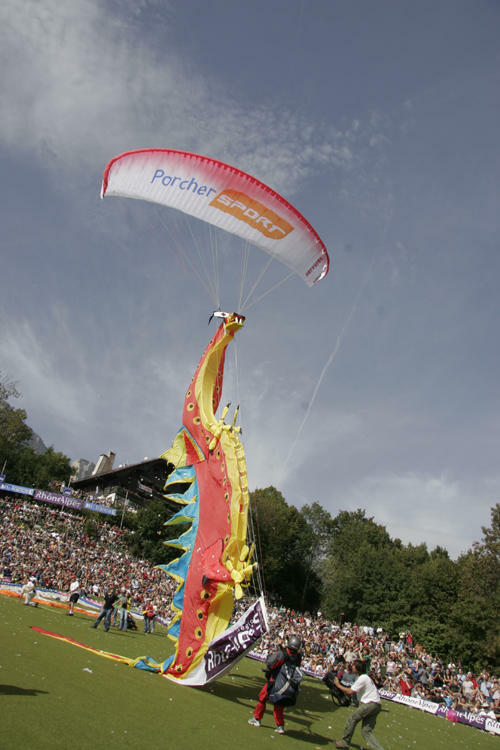 - In 2005 Francis Heilmann makes with the assistance of Porcher Sport, a Sailwing or replica of the first paraglider in history, created in 1965 by American David Barish. - This same year, the company “Dirigeables” presents the first electric blimp: the Electroplume. 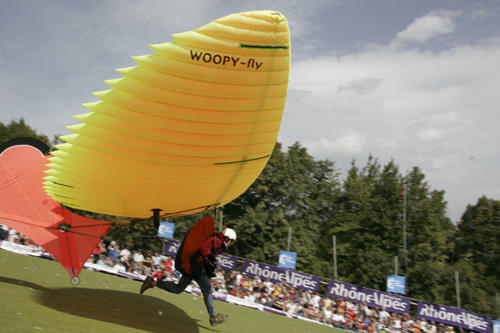 - In 2006, Polish pilot Ryszard Szczepanski presents his ornithopter, a fabulous flapping machine. Precious encounters: in 2000, with American paragliding pioneer, David Barish; in 2006 with French environmental personality and recent presidential candidate, Nicolas Hulot. The Film Festival moves….. Since 2004, an after show of the Festival’s prize-winning films is offered to the public of Grenoble every October. And in 2006, it acquires its own marquee on the South Launch, formerly occupied by “Turbulences”. 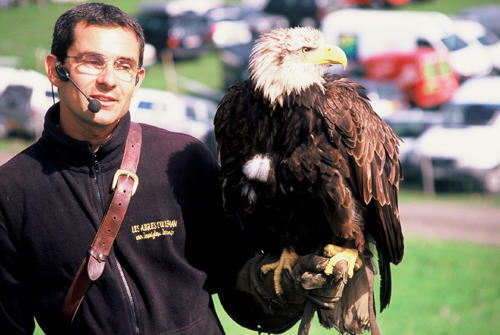 Even birds have a role in the Coupe Icare… starting in 2003, the Eagles of Léman propose a series of falconry demonstrations. Security: in 2004 and 2005, a Tyrolean cable – mounted by NSD, Airwave, Ozone, Sup’Air and Horizon – allows pilots to test their safety chutes. From 2006 on, a untangling team is on hand to help pilots who flirt too much with trees and bushes to untangle their wings! 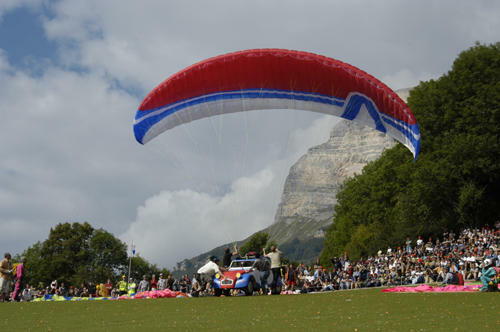 Landing Zone in Lumbin, here too, a variety of activities develop; today the Air Sports Festival is a major meeting place for fans of these disciplines. 2007 inaugurates a new feature: The Children’s Book Fair: a young people’s book fair padded with meetings and stands, treating our favourite themes : air sports, ornithology, etc. In 2000, an annual patchwork show and contest is organized every two years around the themes of air, at the church of St Hilaire. Bruno Thery designs the deliriously colourful posters for 2001 and 2003 to 2007. The Coupe Icare engages in civic and environmental concerns in 2006 – thanks to the AREMACS association dedicated to conscientious trash collecting and sorting. Aérial magazine takes over in 2000 as publications collaborator, where Vol Libre Magazine leaves off. The Coupe Icare.org association in conducting this huge event. A thousand thanks to all of them for their generous time, energy, good humour and loyal support of our team! In 2019 the Coupe Icare will pay homage to Leonardo da Vinci, in celebration of the 500th year since his death. The 4-day event will be largely orchestrated around this illustrious inventor of human flight with a programme of exhibits and animations inspired by or dedicated to the greatest genius of whole Italian Renaissance.